Shahi Paneer Recipe – This is Mughalai paneer recipe. 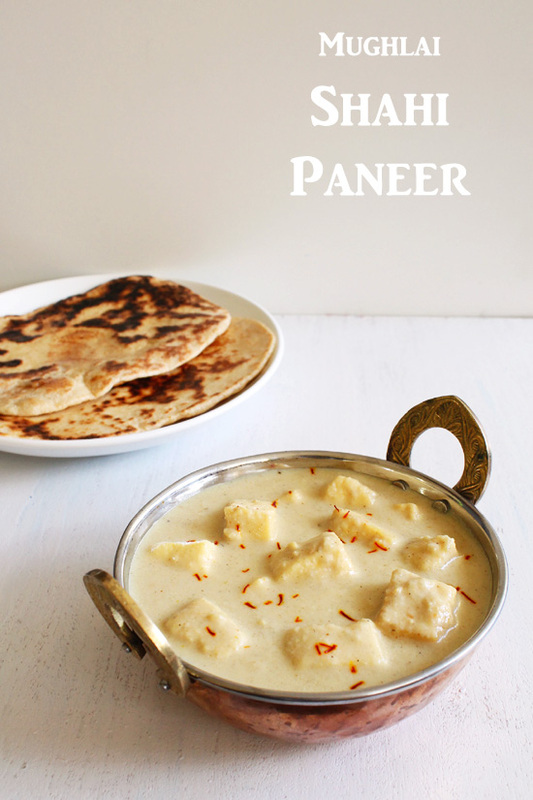 Soft paneer pieces are simmered in rich, creamy, aromatic and flavorful white gravy. 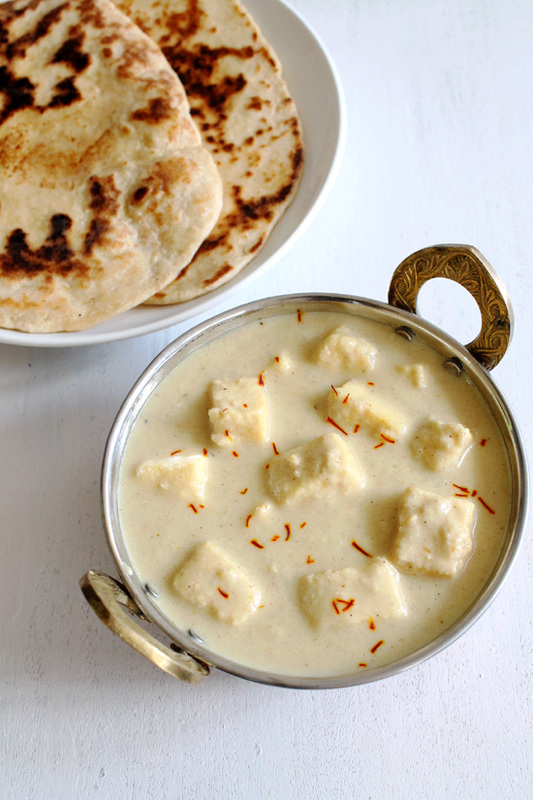 This white gravy is made from boiled onions, yogurt, cashews and saffron. We are using boiled onion paste here. It helps to keep the gravy nice and white. If we fry the onions, it will caramelize and becomes darker or brown in color. Thus the color of the gravy will change and we don’t want that. Because we are making paneer in white gravy. 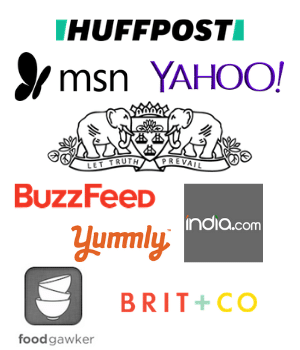 Here we are using good amount of yogurt. Make sure that your yogurt is not sour otherwise the end product will taste sour. Mughlai cuisine is known for distinctive aromatic and rich flavors. The taste may vary from mild to spicy. Today’s shahi paneer dish has mild yet rich flavors, hence it gives authentic mughlai taste and flavors. Since this mughlai paneer is royal dish, saffron is used. It gives unique flavor to the dish. Also it gives slight yellow tinge to the gravy color. This is usually made on special occasion or for special guests as this is quite rich. So it is not advisable to have it on everyday basis. I have used slit green chilies which is the only spicy ingredient in the recipe so use accordingly. I have not chopped the chilies because I wanted to keep gravy really smooth. If chopped chilies are added it ruins the look of the gravy. Soak cashews in ¼ cup water for about 15-20 minutes. Make smooth paste out of it in grinder or blender. Take ½ cup of water and chopped onion in a saucepan. Bring it to a boil on medium heat. Let it simmer for 10-15 minutes or till onions get soft. let it cool down a bit. Meanwhile warm up cream in the microwave and dissolve few saffron strands in it. Saffron will impart its nice color into the cream. Now cooked onion is cooled. Grind into smooth paste using grinder or blender. Heat oil in a pan on medium heat. Once hot add whole spices (cloves, peppercorns, cinnamon and bay leaf) and fry for 30-45 seconds. You will get nice aroma of the spices. Add ginger paste, garlic paste and slit green chilies, fry for few seconds. Mix in onion paste and salt. Cook it till all the moisture evaporates and it starts to leave the sides of the pan. Do not let the paste get brown color. Add prepared cashew nut paste. Mix well. If required add little water for gravy consistency and let come to a simmer. Add garam masala and cardamom powder. Mix and let it simmer for 2 minutes. Turn off the stove. Mughlai shahi paneer is ready to serve. Remove it to a serving bowl. Garnish it with more crushed saffron. It is optional though. Mughlai Shahi Paneer Recipe – Soft paneer pieces are added into rich, creamy white gravy. Warm up cream in the microwave and dissolve few saffron strands in it. Take onion and water in a pan on medium heat. Let it simmer for 10-15 minutes or till onions get soft. Let it cool down a bit. Once cooled, grind into smooth paste. Heat the oil in a pan on medium heat. Once hot add whole spices and fry for 30-45 seconds. Add ginger paste, garlic paste and slit green chilies, saute for few seconds. Mix in onion paste and salt. Cook it till all the moisture evaporates and it starts to leave the sides of the pan. Add prepared cashew nut paste. Stir well. Add yogurt and immediately mix well. If required add little water for gravy consistency and let come to a simmer. Add garam masala and cardamom powder. Mix well. Add paneer pieces and stir very gently. Add cream-saffron mixture. Mix and let it simmer for 2 minutes.